An earlier post on this blog – The Hudson River School– explains the importance of Thomas Cole as the leading light of the Hudson River School and outlines his critical stance towards what he regarded as the wanton destruction of the American landscape by greedy speculators. Two related exhibitions currently on display at London’s National Gallery present Cole’s work (Thomas Cole: Eden to Empire) and a contemporary response by Los Angeles-based artist Ed Ruscha (Course of Empire). The cycle commences with The Savage State (about 1834), which depicts hunter-gatherers in a primeval wilderness. This is followed by The Pastoral or Arcadian State (about 1834) in which humankind is “at one with benign nature.”¹ In the third painting, The Consummation of Empire (1835-6), we see an empress presiding over a procession in a magnificent setting of imposing classical buildings described by Cole himself as “the summit of human glory.”² The fourth painting, Destruction (1836), is an apocalyptic vision in which a raging fire consumes the terraced city, now a scene of havoc and violence. In the final painting in the series, Desolation (1836), the city is empty and in ruins, remnants of a fleeting but destructive human presence, and nature has reclaimed the site. Ed Ruscha, Course of Empire 2005, lithograph, 18 x 15 in. (45.7 x 38.1 cm.) These sketches show the pairing of the earlier and later works. In 1992 Ruscha executed the first cycle of five paintings in his series Course of Empire, inspired by Cole’s series. Called Blue Collar, these five large black and white works show the tops of box-like industrial buildings in Los Angeles. Each building bears a sign clearly indicating its function: Tech-Chem, Tool & Die, Trade School, Telephone (a public telephone booth) and Tires. Each represents an aspect of traditional American industry and the blue collar working experience. This series was followed by another group of five colour paintings made between 2003 and 2005. Here, the original buildings are paired with their contemporary equivalents; Tech-Chem has become Fat Boy, Tool & Die seems to have been taken over by a Korean concern, the trade school is boarded up behind wire fencing, what was the tyre shop has expanded into a larger, now faceless concern and the telephone booth has been replaced by – nothing – this is the era of the cell phone. Ruscha’s ten paintings chart the decline of American industry and the rise of a new age in which the blue collar worker has no place. Ruscha’s ten paintings were shown together for the first time in the United Sates Pavilion at the 51st Venice Biennale in 2005. Shortly afterwards they were shown at the old Whitney. This is the first time Ruscha’s works have been shown together with the Thomas Cole’s series, at the suggestion of Elizabeth Mankin Kornhauser of the Metropolitan Museum of Art in New York, who had hoped to show the exhibition at the Met. This never occurred but the National Gallery responded to the idea and the two artists’ series are presented in two separate locations in the museum – the Cole exhibition covers a broad range of his work, which includes The Course of Empire series. The bodies of work are thus presented as related but not juxtaposed. It is interesting to us that one of the masters of contemporary art today should also be drawn to the themes that Cole addresses in his work. 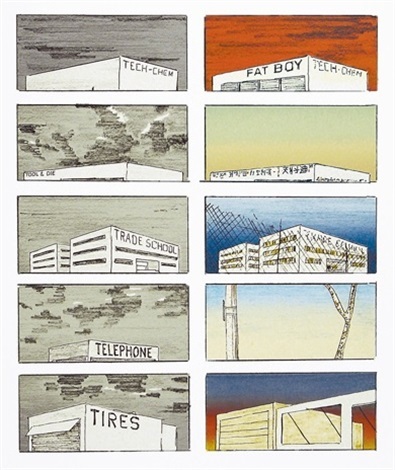 However, while Ruscha concentrates on the decline of the traditional industrial economy in America and the implications of this for the blue collar worker, we are looking at both this and corporate America’s and (to some extent) government’s historical disregard for the natural world in particular and how this affects people and place. The final phrase in the title of this post is taken from the last paragraph of Christopher Riopelle’s essay in the book accompanying the exhibition. Human Accumulations explores the themes of Nature, Progress and American Identity through the comparison of five iconic East Coast American landscapes, as they were represented by the Hudson River School artist Regis Gignoux, and as they appear today through the lens of his descendant, photographer Alan Gignoux.